In this section, you are going to implement the first API operation that provides the functionality for a Hacker News clone: Querying a feed of links that were posted by other users. This process is also referred to as schema-driven or schema-first development. So, let’s go ahead and tackle the first step, extending the GraphQL schema definition. Pretty straightforward. You’re defining a new Link type that represents the links that can be posted to Hacker News. Each Link has an id, a description and url. You’re then adding another root field to the Query type that allows you to retrieve a list of Link elements. This list is guaranteed to never be null (if anything, it will be empty) and never contain any elements that are null - that’s what the two exclamation marks are for. The next step is to implement the resolver function for the feed query. In fact, one thing we haven’t mentioned yet is that not only root fields, but virtually all fields on the types in a GraphQL schema have resolver functions. So, you’ll add resolvers for the id, description and url fields of the Link type as well. The links variable is used to store the links at runtime. For now, everything is stored only in-memory rather than being persisted in a database. You’re adding a new resolver for the feed root field. Notice that a resolver always has to be named after the corresponding field from the schema definition. Finally, you’re adding three more resolvers for the fields on the Link type from the schema definition. We’ll discuss in a bit what the parent argument is that’s passed into the resolver here. 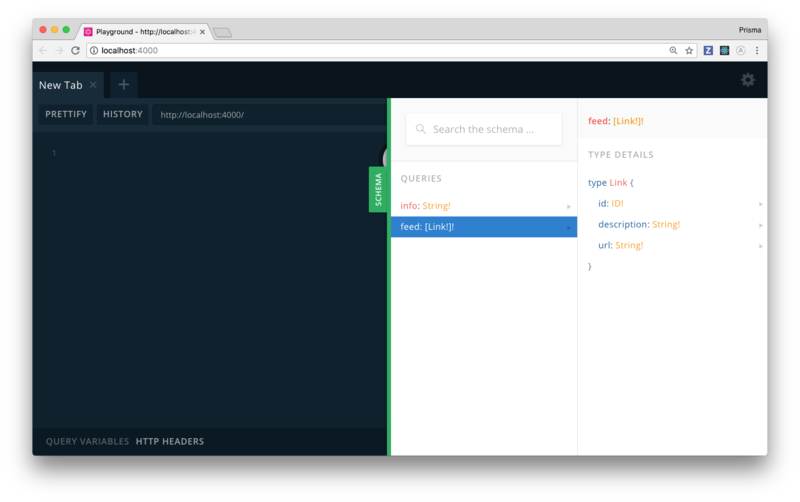 "description": "Fullstack tutorial for GraphQL"
Feel free to play around with the query by removing any fields from the selection set and observe the responses sent by the server. Let’s now quickly talk about how a GraphQL server actually resolves incoming queries. As you already saw, a GraphQL query consists of a number of fields that have their source in the type definitions of the GraphQL schema. All four fields specified in the query, feed, id, url and description can also be found inside the schema definition. Now, you also learned that every field inside the schema definition is backed by one resolver function whose responsibility it is to return the data for precisely that field. Can you imagine what the query resolution process now looks like? Effectively, everything the GraphQL server has to do is invoke all resolver functions for the fields that are contained in the query and then package up the response according to the query’s shape. Query resolution thus merely becomes a process of orchestrating the invocation of resolver functions! First, it’s important to note that every GraphQL resolver function actually receives four input arguments. As the remaining three are not needed in our scenario right now, we’re simply omitting them. Don’t worry, you’ll get to know them soon. Well, as you already saw, GraphQL queries can be nested. Each level of nesting (i.e. nested curly braces) corresponds to one resolver execution level. The above query therefore has two of these execution levels. On the first level, it invokes the feed resolver and returns the entire data stored in links. For the second execution level, the GraphQL server is smart enough to invoke the resolvers of the Link type (because thanks to the schema, it knows that feed returns a list of Link elements) for each element inside the list that was returned on the previous resolver level. Therefore, in every of the three Link resolvers, the incoming parent object is the element inside the links list. Note: To learn more about this, check out this article. How are GraphQL queries resolved?